I recently co-presented a webinar session for eCampus Ontario, along with Jessica O’Reilly and Laura Killam from Cambrian College. 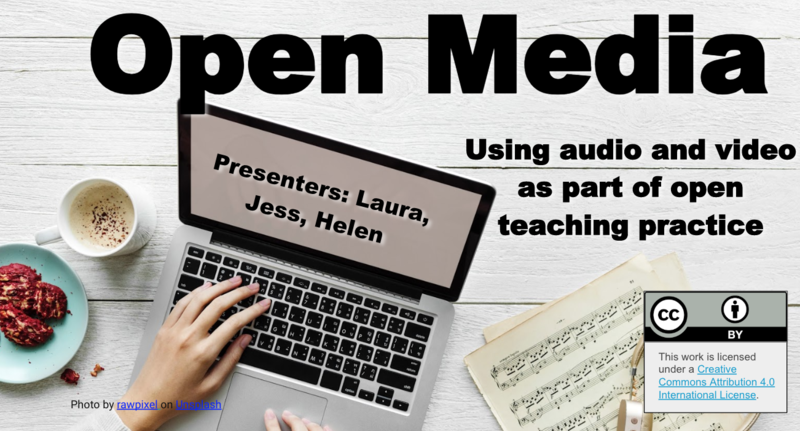 This session, Open Media: Using audio and video as part of open teaching practice is worth a peek when you have some time. 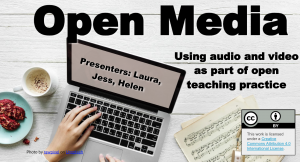 This session provides tips, links, and research resources to convince you to try using audio and video in your teaching. You can pick one tip and try it. Reach out on Twitter to Laura @NurseKillam, Jessica @Cambrian_Jess, or myself @hj_dewaard for any support or questions. 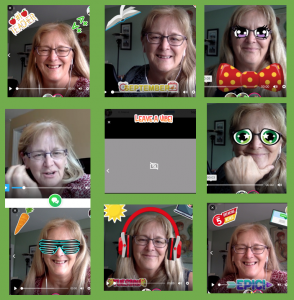 I’ve used video in a variety of ways in my teaching, but the most recent use is with a FREE digital resource called Flipgrid. Here’s a 9×9 collection of Flipgrid responses, showing the many faces I’ve made using this gem of a digital resource. As you begin to use video responses in Flipgrid, it’s important to remember to carefully consider the needs of your students. Build choice into this activity. Consider if students are ready to share their video recording using their own faces. Explicitly let student know they can do voice-only recording. To describe it best, I’ll use Flipgrid’s own words: “A Grid is your classroom or community of learners. Grids have Topics and Topics have Responses”. So you create a grid for your group of students or participants. Within that grid you can have a variety of topics where students can respond. This can be a great way to begin a class – even if your students are physically present. It could be used as an ‘exit ticket’ to consolidate understanding on a topic. It could be an informal assessment tool to provide feedback to your students. Flipgrid’s default mode is secure – you’ll need the code and link to enter the grid topic. Each video has it’s own unique URL link so you can share just the videos you create with the audience you select. Once the topic is completed, you can ‘freeze’ or deactivate the grid or topic, preventing further submissions. For me, as the instructor, I try to go first to model how to engage using this digital device, and set the tone for student engagement. The week that I used Flipgrid this year, I monitored closely for student responses, and provided a feedback message or prompting question to further their thinking. I enjoyed seeing my online students this way, and certainly got to know them better through their video/audio responses. If you’d like to learn more about using video options in your teaching, or want to consider audio and video feedback, take a look at these chapters in the book Humanizing Online Teaching and Learning, a peer reviewed book edited by Whitney Kilgore. It’s available as a free, Creative Commons licensed Pressbook. Link to the webinar video recording will be included here once it’s posted on the eCampus Ontario website.